With the TiVo Mini Vox, you can now play the videos on TV from the PC, mobile phones, popular video streaming apps, like the Netflix, Amazon, Hulu and more. But what if you got some Blu-rays to watch on TV? Can TiVo Mini Vox work with that? Unfortunately, TiVo Mini Vox doesn't provide the DVD drive, so that you can't play Blu-ray movies on TiVo Mini Vox directly. To transfer Blu-ray movies to TiVo Mini Vox for enjoyment, just read on this article to get a simple solution. It is not too hard for us to find the truth: You can copy the Blu-ray to USB flash drive and play the Blu-ray videos on TiVo Mini Vox with USB. Don’t be panic, you can get the best solution for playing Blu-ray on TiVo Mini Vox. All you need is a Blu-ray to TiVo Mini Vox Converter- Pavtube ByteCopy that not only facilitates you to strip off the complicated region and copy protection from your Blu-ray disc, but also helps you to convert Blu-ray to TiVo Mini Vox best playable formats, such as MP4. This software also provides multi-track lossless MKV videos which can keep all video audio tracks, subtitles, chapters, you also can easily remove the audio tracks, subtitles, chapters you don’t need. 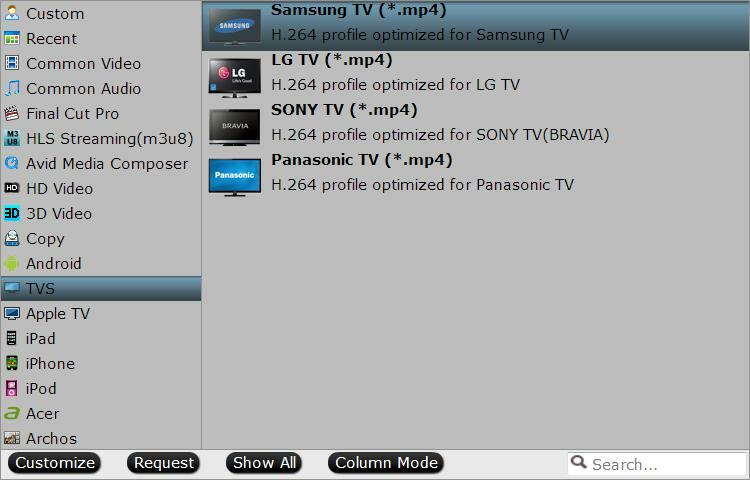 If you are going to stream the Blu-ray movies with TiVo Mini Vox for watching your large screen TV, the software also gives you the chance to directly output Samsung/Sony/Panasonic/LG TV preset profile format so that you don't need to do any extra complicated profile settings. If you are Mac user, you can turn to Pavtube ByteCopy for Mac (macOS High Sierra included), which has the same function as the Windows version. Here is how to do it. Insert your Blu-ray disc into an external Blu-ray drive, launch the program on your computer, click "File" > "Load from disc" to load Blu-ray disc to the program. 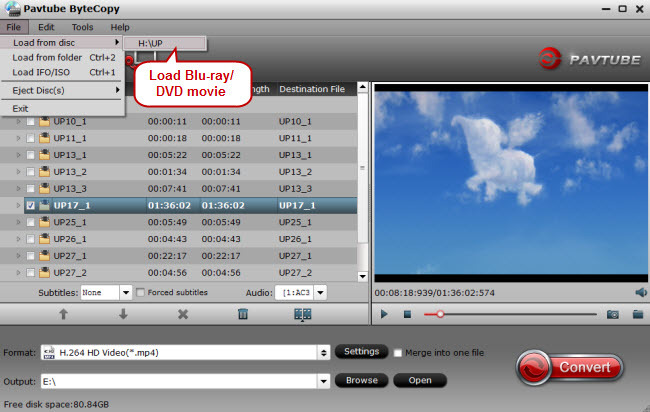 Tip 3: When you load the DVD and Blu-ray disc, this software can detect the DVD and Blu-ray main title automatically. Click "Format" bar, choose TiVo Mini Vox best playable format such as ""H.264 HD Video(*.mp4)" under "HD Video" main category. Tip 4: Since the TiVo Mini VOX is now compatible with 4K Ultra HD, here you can hit “Settings” icon to open profile settings window, and adjust the output file resolution as "3840*2160" by typing the value beside the brackets of "Size(pix)" in the video section. Tip 5: To watch Blu-ray movies on TV via TiVo Mini VOX, you can also choose TV customized file format according to your TV brand. Hit the “Convert” button to start Blu-ray to Tivo Mini VOX MP4 conversion. After conversion, hit "Open output folder" to quickly find ripped videos. After that you can transfer converted MP4 videos from computer to Tivo Mini VOX or other storage devices for viewing on TV. How to Transfer Videos From Computer to TiVo Mini VOX? You can use Tivo Desktop software to transfer converted Blu-ray movies to your Tivo Mini VOX. Firstly, open "My Documents" folder, by default there is a subfolder called "My Tivo Recordings", move your converted MP4 files to it. Then, launch TiVo Desktop, Just goto the Now Playing List, scroll all the way to the bottom, click on your Computer Name, and select the movie for transfer. After that, the videos will be transferred to Tivo Mini VOX automatically. We can enjoy them freely now.